Incompetence, unethical behavior, and greed on the part of our government and the financial services industry started the real estate debacle in the first place, and have kept it going. This is because rather than fixing the housing problem at the root of all of this economic pain, we’ve bailed out every other industry that the housing crisis caused, instead. The $8,000 tax credit should have been instituted for any buyer purchasing any home; but no, our politicians have sent money to the bankers and the car industry, and placed our unborn grandchildren in economic peril. Low cost assumable step-loan programs would have prevented much of what has ailed us and what will be ailing us for decades, had they been the first response on the part of government and policy makers. They also would have likely prevented all the bail outs. For example, loans starting at 2%, graduating to 3%, and then remaining fixed at 4% for the life of the loan (not the way Chase means, i.e., doesn’t really mean: “for the life of the loan”; rather, “fixed at 4% for the life of the loan, no kidding – we won’t come back and screw you in two years” loans) would have been a robust configuration to get the housing market moving again. The assumable part is a key element. At the risk of dating myself, I have lived long enough to remember a time when real estate loans were high enough (e.g., 17 to 18 percent) such that the question was not so much about the price of the house; rather, it was did the seller have an assumable loan at a more reasonable rate? It was about the “paper,” not the price or the property. The idea is to have a piece of paper that was so attractive that every potential buyer would have lined up out the door to purchase real estate, and even if one buyer later defaulted subsequent purchasers would want to grab the “paper” that was associated with a given home (hence, keeping the home from falling into distress, despite the default). A simple loan program as I have sketched out above for real estate financing, had it been put in place early on, could have prevented altogether or at least significantly lessoned the impact of the foreclosure crisis and all that has followed with bail out after bail out, and government spending programs galore. Stimulating entrepreneurs on main street, always a good idea even without a crisis, would have been another productive step. Several economists have told me that I’m pretty close in my guess that such a loan program could have been operated at “break-even,” had the government taken such steps (instead of helping AIG throw more parties and bailing out the likes of Chase with $25 billion in taxpayer’s money). I hate to say it, but we’re not going to break even on the money we’ve sent to America’s corporate elite. Same old story, especially in hard times: the rich buy out the poor and get more, while the poor give up what little they have. As human history might suggest, eventually, in the face of serfdom uprisings start, tyrants are displaced (e.g., killed or banished), and the cycle repeats itself. Posted in: "Bail Out", Editorial-Opinion, Entrepreneurship. then there is the almost one trillion dollars in consumer credit card debt that nobody seems interested in helping consumers pay down. Same idea applies, just offer zero percent interest on all outstanding credit card debt that is older than 3 years. Make it applicable to anyone that is paying more than 9.99% interest. Until consumers can both pay down their old credit card debts while also either saving money or making new purchases with cash, nothing will improve that much. I want a better deal. Why won’t they pay me to borrow cash? The answer to the recession is a simple one: lower the mortgage rate. Banks are borrowing at 0%, and lending at absurd rates, and making large profits. If mortgage and loan rates were reduced to 3 or 4%, the housing and auto markets would take off, and foreclosures would be a thing of the past. The whole bailout thing has been the largest scam pulled on the American people yet. It is designed to make the banks, automobile companies and wall street solvent, and to get rid of all their debts. All the while funding it with taxpayer money. The bail outs and billions do nothing to stop foreclosures, interest rates, predatory lending, and unemployment. Unfortunately, it will be awhile until the public catches on and does something about it. My OPT OUT topic is still going strong at open gov. 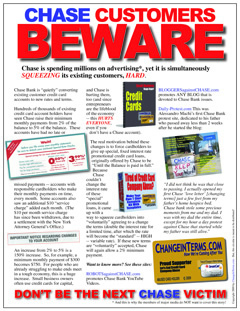 Please vote for this issue as it is at the core of what Chase Bank has done wrong. If consumers have the right to OPT OUT when a bank changes terms, then consumers can at least keep an agreement in place without being forced to accept new terms that favor the banks. Of course, if OPTING OUT becomes a consumer right, OPTING OUT should not lower one’s fico credit score. The media is at a crossroad. Do they continue to bow to the Chase Banks of the world and their advertising money, or do they acknowledge the need for increased regionalized advertising in the national market? Regionalized advertising would replace some of the corporate advertising dollars by pooling the dollars from several hundred small businesses located all over the country into a time or space slot currently sold to Chase Bank. A small business in St. Louis could advertise on the television show “The Office”, but in the St. Louis area only. Regionalizing advertising would reduce Chase Bank style of corporate advertisings influence over the media and would instantly create thousands of media buy jobs. A Denver small business could advertise in Time Magazine, but only the ones that are going to Colorado. The corporate business module is destroying middle america because the media relies too heavily on corporate america’s advertising dollars. With the corporate influence minimized, news stations could ask the hard hitting questions they presently don’t ask. Of course those sub prime loans could have been modified to escalate slowly rather than overnight, but it appears the plan was to let the catastrophe happen, then deepen the catastrophe by raising credit card interest rates at the worst possible time. lowers costs for small business to advertise with them while also creating tens of thousands of additional advertising sales jobs.